Percussion is an assessment technique which produces sounds by the examiner tapping on the patient's chest wall. Just as lightly tapping on a container with your hands produces various sounds, so tapping on the chest wall produces sounds based on the amount of air in the lungs. Percussion sets the chest wall and underlying tissues into motion, producing audible sounds and palpable vibrations. Percussion helps to determine whether the underlying tissues are filled with air, fluid, or solid material. Percussing the anterior chest is most easily done with the patient lying supine; the patient should sit when percussing the posterior chest. Place the first part of the middle finger of your nondominant hand firmly on the patient's skin. Then, strike the finger placed on the patient's skin with the end of the middle finger of your dominant hand. Watch a video segment of percussion technique. Work from the top part of the chest downward, comparing sounds heard on both the right and left sides of the chest. Visualize the structures underneath as you proceed. Resonant sounds are low pitched, hollow sounds heard over normal lung tissue. Flat or extremely dull sounds are normally heard over solid areas such as bones. Dull or thudlike sounds are normally heard over dense areas such as the heart or liver. Dullness replaces resonance when fluid or solid tissue replaces air-containing lung tissues, such as occurs with pneumonia, pleural effusions, or tumors. 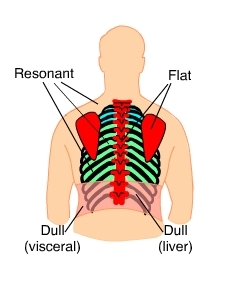 Hyperresonant sounds that are louder and lower pitched than resonant sounds are normally heard when percussing the chests of children and very thin adults. Hyperresonant sounds may also be heard when percussing lungs hyperinflated with air, such as may occur in patients with COPD, or patients having an acute asthmatic attack. An area of hyperresonance on one side of the chest may indicate a pneumothorax. Tympanic sounds are hollow, high, drumlike sounds. Tympany is normally heard over the stomach, but is not a normal chest sound. Tympanic sounds heard over the chest indicate excessive air in the chest, such as may occur with pneumothorax. The normal sound expected on percussion throughout most of the lung fields is resonance.